I doubt that poll is accurate. Stalin was Georgian communist barbarian, that killed far too many people to not deserve public toilets named after him. its not like this friend. Stalin won WWII.. how can not be highly respected by Russian public? The Allies together fought and won the war. In fact when Stalin was polishing Hitler's Maschinengewehr and supplying him with raw materials and minerals (for over a good year in WW2), it was down to countries like the UK, Canada, Australia/New Zealand, Greece, Yugoslavia and so on to try fight back that maniac and his axis allies. Communists were infamous in sitting out the war at the very crucial beginning and appeasing Hitler at the start. They will always be remembered for that. Stalin is no exception. though there was basically zero resource link between Germany and Japan. Please spread some more thick and rich NATO revisionist drivel in a Russian forum, troll. Very few Russians are Stalin's apologists. Feel free to be one of them. PS. Allies won the war, that includes Soviets. I didn't say western Allies only. But it was a joint victory in Europe, and an American victory in the Pacific. Earlier you were talking about 1939-41, I assume? It made sense for the Soviets. For one thing, the Red Army wasn't ready at the time, as the Winter War and Operation Barbarossa showed. And it's not like the Soviets didn't try to slow down/stop Germany earlier, but it didn't work out. Geopolitics. The Munich agreement, Polish "deals" with Germany to carve of Czechoslovakia, etc. can also be very conveniently forgotten. Secondly, even in the Pacific the Soviet invasion of Manchuria contributed quite heavily to the surrender of the Japanese. Also, the Chinese forced tied-up a considerable amount of Japan's resources. The Russian (mixed) support for Stalin makes sense due to WW2 (or rather, the Great Patriotic War). It's perfectly understandable. Western propaganda has also conveniently forgotten how many Western countries commemorate many more or less "questionable" figures. Like them, Stalin was a victor of history, and he's certainly that in Russia (and in many other places in the former USSR), despite the Soviet Union collapsing decades after his death. And the cold war era Western propaganda has made it worse. Anatoly Karlin has actually written about this. The so-called Russian liberals and that cold era propaganda exaggerated Stalin's crimes. "Muh Stalin killed 60 million people. He was actually worse than Hitler." (Spoiler alert: he didn't, he wasn't.) So Stalin is of course often used in anti-Russian propaganda. Russian support for Stalin is a counter reaction to all of that. Kimppis wrote: Earlier you were talking about 1939-41, I assume? It made sense for the Soviets. For one thing, the Red Army wasn't ready at the time, as the Winter War and Operation Barbarossa showed. And it's not like the Soviets didn't try to slow down/stop Germany earlier, but it didn't work out. Geopolitics. The Munich agreement, Polish "deals" with Germany to carve of Czechoslovakia, etc. can also be very conveniently forgotten. Stalin wasn't Russian he was Georgian and communist. Whoever equates Stalin to Russia is a retard, across the board. As should be obvious, I'm not a fan Stalin. But to be fair, I think Stalin viewed himself as Russian. I guess you could call him Georgian-Russian or something. It's all about the Great Patriotic War (+ the liberal propaganda and cold war era historiography), when it comes to the Russians and their views on him. Stalin did continue to send materials to Germany.... materials Germany had paid for... why wouldn't they deliver goods paid for? And it is amusing that you suggest those heroic western allies fought alone for a year... the western allies appeased Hitler as much as anyone else did... in fact poland even took advantage of Germanys expansion to expand itself in several areas, but Poland is just a victim. Stalin approached Poland and the UK for an alliance... neither responded... Poland preferring to trust the european germans rather than the half asian communist Soviets. BTW can we have our people back... if the US won the war in the Pacific then our guys were clearly not needed... especially for the first bit when the Americans were not even involved. GarryB wrote: Stalin did continue to send materials to Germany.... materials Germany had paid for... why wouldn't they deliver goods paid for? Poland took part in snatching parts of Czechoslovakia when Germany went for Sudetia in there. They are no saints. The US are not an example to follow when it comes to their stance to Germany. But neither is the USSR. 1939 and 1940 were not easy years for some countries. USA and USSR skipped the war then. I still think what happened in Ukraine and now in Poland the removal of such monuments is a disgrace Ukraine's soviet monuments were great one of the reasons I visited it a few times. They are removing history and a recognition not just to Russians and other people of other ex soviet countries but to their own people is a disgrace. Once removed now ever goes in its place. There was talk of removing mother Russia statue in Kiev and scrapping the stainless steel which worth quite a bit but if that's done then there will be no decent statutes left in Kiev and what would tourists come to see? Empty plinths? I am totally against removing any historic statue you can't rewrite history but we can learn from it and should knowledge it. Eastern Europe is fast becoming an uninteresting place very fast to me. Alyosha Monument, Monument of the Defenders of the Soviet Arctic during the Great Patriotic War. 30+ metres high, on a promontory overlooking the city, the docks and the fjord. Built where the female antiaircraft gunners resisted the Luftwaffe. A good place to pause and consider the enormity of what happened here and to get an overview of the modern city. One can see the Alyosha Monument from just about anywhere in Murmansk. Its soldier looms over you as it looks to the horizon. And as you get closer to it, its massive size and height exudes the strength that I think its designers wanted to convey. But neither is the USSR. 1939 and 1940 were not easy years for some countries. USA and USSR skipped the war then. The UK and most of the west helped the opposition to the reds in the russian civil war... what possible reason would the Soviets have to help France or the UK? In the end the Germans attacked the Soviets instead of the British and the British did what Stalin would have done... nothing while the Germans and Soviets wore each other out... it couldn't have gone better for the British if they had planned it that way... it would not surprise me if they didn't have a hand in getting Hitler to fixate on living space in the east to push him that way. BTW nice to see the Buran get some pride of place... derided in the west as just a space shuttle copy... ironically if there was a space shuttle design that might have worked this was it. GarryB wrote: BTW nice to see the Buran get some pride of place... derided in the west as just a space shuttle copy... ironically if there was a space shuttle design that might have worked this was it. Funnily enough neither was a shuttle, they were both orbital nuclear bombers. So they shopped around for money and Pentagon got involved with their cash and design "input"
Once Soviets saw it they realized instantly that there was only be reasonable purpose for something like that and it was neither crew, cargo or reusability. It was nuclear war. 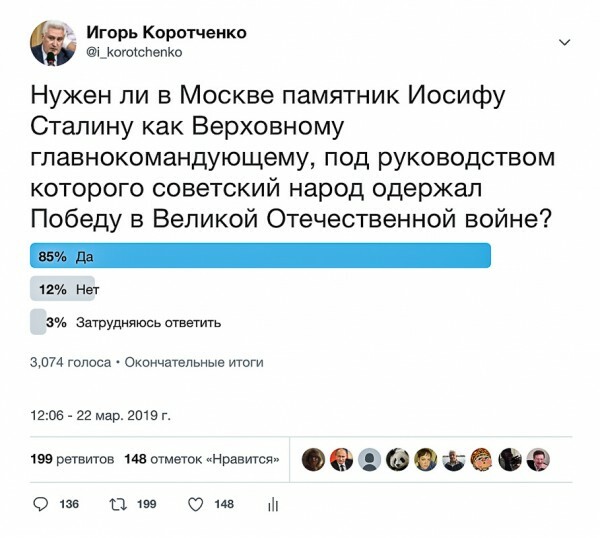 Results of a survey on the need to open a monument to Joseph Stalin in Moscow: 85 percent - "For"
Like him or loathe him, he had an enormous influence on Russia past present and future.